Owning a dependable coffee machine is almost every coffee drinker dream. Between those many options, Keurig Rivo and Nespresso Lattissima are two great options to go. Not only they can make your coffee in a short time they also comes with milk frother for coffee and milk based beverages. Go check our article below before making any purchase to help you decide which machine is the better option. Keurig Rivo is a cappuccino and latte system by the pioneer of single brew coffee machine makers Keurig. This machine’s name is derived from an Italian word for “revolutionary “ for its ability to serve you tasty coffee anytime you want. Not only able to produce delicious coffee you will surely love, the operation of the machine is also very simple even novice coffee machine users can operate it with ease. For you who want to own a machine that can simplify your life, Keurig Rivo is a great option. 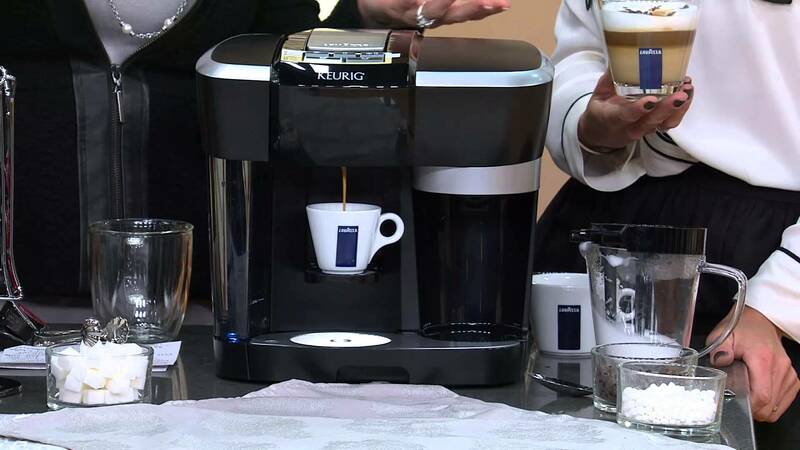 From the outside, Keurig Rivo has a bulky body that was constructed from plastic material in black color. The water reservoir is placed at the side of the unit and made from clear plastic, so you can see the water level clearly. The buttons or controls you need to operate the machine are all placed at the top for convenient operation instead at the front like many similar machines. Measuring at 11.4 x 10.8 x 11.4 inches, even though it looks bulky in picture. The unit is actually compact enough for you to place it in any flat surface in your kitchen or offices. Keurig Rivo boast its capability in serving various coffee taste options from the provided pods. The pod you can use in the machine is the small LavAzza pods. This is clearly a disadvantage for a great machine like this one since the option are very limited and chances are you are going to get bored too quickly for it lacks of options. The options you can choose are limited to Espresso Intenso, Classico, Delicato, and Decaf. 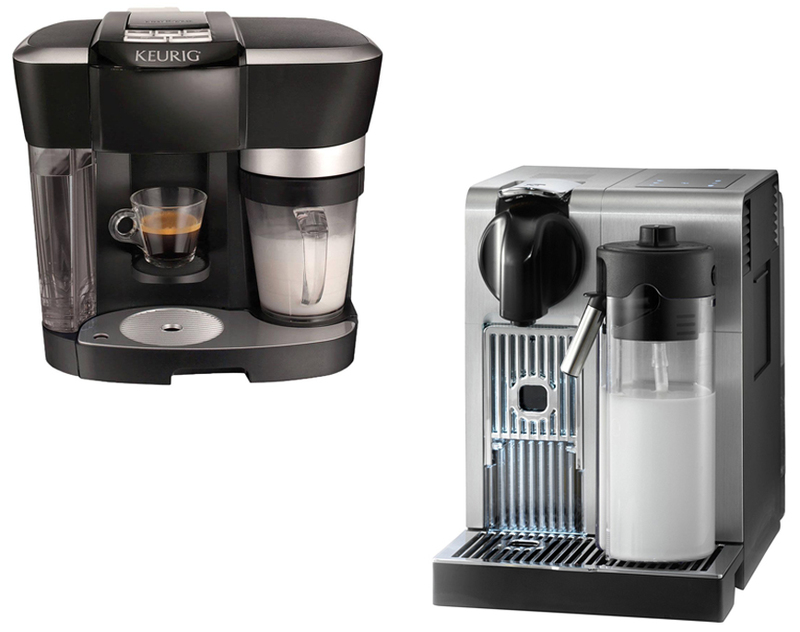 For another similar machine, check our article on Keurig Rivo vs Starbucks Verismo here. If compared to other Keurig machines, the pod choices are indeed fewer. However, if you do love and often serve those 4 coffees, you may don’t mind about the limitation. For you who often drink or like coffee and milk based beverages, you will be delighted for Keurig Rivo comes with a milk frother, which is also the main selling point of the machine since many people are drinking their coffee with frothed milk for richer and milder taste. The frother is suitable to froth any type of milk beside regular cow’s milk if and if you want to, you can use soy or almond milk as well. From the brewing options, the machine offer you two brewing sizes including short (1.4 oz) and lungo (2.8 oz). These options are perfect for people who drink their coffee at home, but it is not enough if you want to fill your Tumbler to bring it with you. You may overcome the issue by repeating the operation until you reach the preferred amount. Nespresso Lattissima is a coffee machine by another famous single coffee brewer maker Nespresso. Even though it is branded as Nespresso, the unit is actually manufactured by the Italian coffee machine manufacturer DeLonghi. Coming from DeLonghi you can expect that the machine is capable in providing you delicious coffee in a simpler way. For those who live a busy life and just want to speed things up in the morning, Nespresso Lattissima is a great option to go. The Nespresso Lattissima in our article here is the Pro version. From the outside, this machine does look very sturdy for it was made with a combination of plastic and brushed stainless steel with gorgeous Italian style. For a modern touch, all the control you need to operate the machine is placed at the top area with sensor touch display. The water reservoir is placed at the back and made with clear material, so you can see the water level clearly. Nespresso Lattissima boast its capability in making authentic Italian espresso based beverages. One great feature in the machine is it comes with milk frother, so you can make any coffee and milk based beverages you want with ease. The capsules you can use is of course will be limited to only Nespresso pods, but they do comes in a wide range of taste more than 23 variations of coffee start from medium to very dark roast as well as decaf pods for those who avoid caffeine. Another great thing with Nespresso Lattissima is the cup tray for it can accommodate giant American style coffee travel mug. With this adjustable tray, you can place your tumbler with ease directly below the coffee spout. When using the machine, you may choose between three different brewing sizes including ristretto, espresso, and lungo. If you are not in the mood for coffee, the machine will be able to dispense only hot water for your cup noodle or soup. When we are talking about espresso machine, pressure power shouldn’t be leaved out. Nespresso Lattissima comes with 19 bars of pressure to powerfully extract the ground full flavor inside your pods into your cups in no time. You also don’t have to wait for the machine to heat up when you use it in repetitive operation since it will maintain the heat. The intuitive touch display at the top of the machine is very sensitive for simpler and modern operation. Now, let’s compare Keurig Rivo with Nespresso Lattissima. 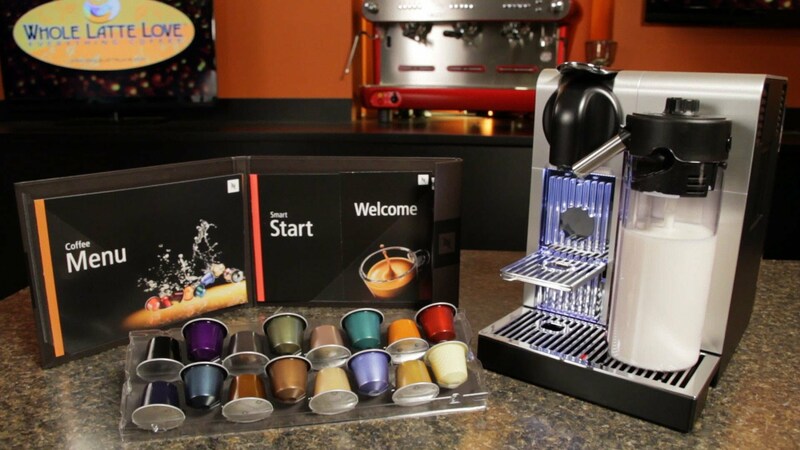 From the ability, the Nespresso Lattissima Pro have better capabilities than Keurig Rivo. For example the pods option, Nespresso offer a wider range of pods as well as seasonal beverage while Keurig Rivo only able to use 4 pods. Another example is brewing option, Keurig Rivo only able to brew 2 sizes while Nespresso Lattissima is able to serve 3 coffee sizes plus cappuccino, latte, and hot milk. All in all, the decision is all yours to make. In our opinion, Nespresso Lattissima is better for it have wider pod options to keep you from getting bored quickly and if you don’t mind about the price, we highly recommend you Nespresso Lattissima to help you serve your favorite beverage everyday.